قیصری, اسماعیل, قادر, سرمد, علی‌اکبری بیدختی, عباسعلی. (1395). حل عددی معادلات بوسینسک تراکم‌ناپذیر با استفاده از روش فشرده ترکیبی مرتبه ششم. 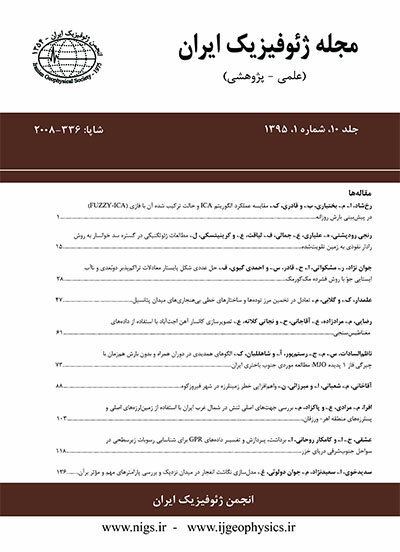 مجله ژئوفیزیک ایران, 10(3), 53-65. اسماعیل قیصری; سرمد قادر; عباسعلی علی‌اکبری بیدختی. "حل عددی معادلات بوسینسک تراکم‌ناپذیر با استفاده از روش فشرده ترکیبی مرتبه ششم". مجله ژئوفیزیک ایران, 10, 3, 1395, 53-65. قیصری, اسماعیل, قادر, سرمد, علی‌اکبری بیدختی, عباسعلی. (1395). 'حل عددی معادلات بوسینسک تراکم‌ناپذیر با استفاده از روش فشرده ترکیبی مرتبه ششم', مجله ژئوفیزیک ایران, 10(3), pp. 53-65. قیصری, اسماعیل, قادر, سرمد, علی‌اکبری بیدختی, عباسعلی. حل عددی معادلات بوسینسک تراکم‌ناپذیر با استفاده از روش فشرده ترکیبی مرتبه ششم. مجله ژئوفیزیک ایران, 1395; 10(3): 53-65. حل دقیق معادلات حاکم بر جریان گرانی می‌تواند در تحلیل دینامیک پدیده‌های جوّی و اقیانوسی مرتبط مفید باشد. در این کار معادلات حاکم بر جریان گرانی با تقریب بوسینسک در قالب شارش گرانی Lock exchange با استفاده از روش فشرده ترکیبی مرتبه ششم حل عددی می‌شوند. به‌منظور مقایسه دقت روش فشرده ترکیبی مرتبه ششم با روش‌های مرتبه دوم مرکزی و فشرده مرتبه چهارم، از حل عددی مسئله گردش اقیانوسی استومل استفاده شده است. با استفاده از مسئله موردی جریان گرانی Lock exchange به‌شکل‌های جریان گرانی تخت و استوانه‌ای، توانایی تفکیک روش فشرده ترکیبی مرتبه ششم در معادلات غیرخطی که به واقعیت نزدیک‌ترند سنجیده می‌شود. برای شبیه‌سازی عددی شرایط مرزی روابط متناسب با روش فشرده ترکیبی مرتبه ششم با در نظر گرفتن شرایط مرزی بدون لغزش اعمال می‌شود. مقایسه کیفی نتایج حل عددی با کار دیگران حاکی از عملکرد بهتر روش فشرده ترکیبی مرتبه ششم است. به‌علاوه مقایسه کیفی و کمّی نتایج حل عددی با استفاده از روش فشرده ترکیبی مرتبه ششم در مقایسه با روش‌های فشرده مرتبه چهارم و مرتبه دوم مرکزی نیز بیانگر عملکرد مناسب‌تر روش فشرده ترکیبی مرتبه ششم می‌باشد. In recent years, substantial amounts of research work have been devoted to using highly accurate numerical methods in the numerical solution of complex flow fields with multi-scale structures. The compact finite-difference methods are simple and powerful ways to attain the purpose of high accuracy and low computational costs. Compact schemes, compared with the traditional explicit finite difference schemes of the same order, have proved to be significantly more accurate along with the benefit of using smaller stencil sizes, which can be essential in treating non-periodic boundary conditions. Applications of some families of the compact schemes to spatial differencing of some idealized models of the atmosphere and oceans show that the compact finite difference schemes are promising methods for the numerical simulation of the atmosphere–ocean dynamics problems. This work is devoted to the application of the combined compact finite-difference method to the numerical solution of the gravity current problem. The two-dimensional incompressible Boussinesq equations constitute the governing equations that are used here for the numerical simulation of such flows. The focus of this work is on the application of the sixth-order combined compact finite difference method to spatial differencing of the vorticity-stream function-temperature formulation of the governing equations. First, we express formulation of the governing equations in dimensionless form. Then, we discretize the governing equations in time and space. For the spatial differencing of the governing equations, the sixth-order combined compact finite difference scheme is used and the classical fourth-order Runge–Kutta is used to advance the Boussinesq equations in time. Details of spatial differencing of the boundary conditions required to generate stable numerical solutions are presented. Furthermore, the details of development and implementation of appropriate no-slip boundary conditions, compatible with the sixth-order combined compact method, are presented. To assess the numerical accuracy, the Stommel ocean circulation model with known exact analytical solution is used as a linear prototype test problem. The performance of the sixth-order combined compact method is then compared with the conventional second-order centered and the fourth-order compact finite difference schemes. The global error estimations indicate the better performance of the sixth-order combined compact method over the conventional second-order centered and the fourth-order compact in term of accuracy. The two-dimensional planar and cylindrical lock-exchange flow configurations are used to conduct the numerical experiments using the governing Boussinesq equations. In this work, we used the no-penetration boundary conditions for temperature and no-slip boundary conditions for vorticity at walls compatible with the sixth-order combined compact scheme.The results are then compared qualitatively with the results presented by other researchers. Quantitative and qualitative comparisons of the results of the present work with the other published results for the planar lock-exchange flow indicate the better performance of the sixth-order combined compact scheme for the numerical solution of the two-dimensional incompressible Boussinesq equations over the second-order centered and the fourth-order compact methods. Hence, such methods can be used in numerical modelling of large-scale flows in the atmosphere and ocean with higher resolutions. بیدختی، ع. ع.، بیوک، ن.، و ثقفی، م. ع.، 1384، بررسی ساختار چند جریان جستناک توفان‌های همرفتی تهران با استفاده از داده‌های سودار: مجله فیزیک زمین و فضا، 30 (2)، 93-113. بیدختی، ع. ع.، مالکی فرد، ف.، و خوش‌سیما، م.، 1386، بررسی تجربی اختلاط تلاطمی نزدیک یک مرز چگال: مجله فیزیک زمین و فضا، 33 (3)، 87-97. قادر، س.، قاسمی ورنامخواستی، ا.، بنازاده ماهانی، م. ر.، و منصوری، د.، 1390، حل عددی معادلات بوسینسک تراکم‌ناپذیر با استفاده از روش فشرده مرتبه چهارم: بررسی موردی شارش گرانی تبادلی: مجله فیزیک زمین و فضا، 37 (1)، 1-17. قیصری، ا.، 1394، شبیه‌سازی عددی جریان گرانی با استفاده از روش فشرده ترکیبی مرتبه ششم: پایان‌نامه کارشناسی ارشد در رشته هواشناسی، مؤسسه ژئوفیزیک دانشگاه تهران. Arakawa, A., 1966, Computational design for long-term numerical integration of the equations of fluid motion: Two dimensional incompressible flwo: J. Comput. Phys., 1, 119–143. Benjamin, T. B., 1968, Gravity currents and related phenomena: J. Fluid Mech., 31, 209–248. Cantero, M. I., Balanchandar, S. and Garcia, M. H., 2007, High resolution simulations of cylindrical density currents: J. Fluid. Mech., 590, 437–469. Chu, P. C., and Fan, C., 1998, A three-point combined compact difference scheme: J. Coumput. Phys., 140, 370–399. Durran, D. R., 2010, Numerical Methods for Fluid Dynamics: Sprringer-verlag, New York. Elias, N. R., Paulo, L. B., Paraizo and Alvaro, L. G. A. Coutinho, 2008, Stabilized edge-based finite element computation of gravity currents in lock-exchange configurations: Int. J. Numer. Meth. Fluids, 57, 1137–1152. Fannelop, T. K., 1994, Fluid Mechanics for Industrial Safety and Environmental Protection: Elsevier. Fox, L. and Goodwin, E. T., 1949, Some new method for the numerical integration of ordinary differential equations: Proc. Cambridge Phil. Soc. Math. Phys., 45, 373–388. Ghader, S., Ghasemi, A., Banazadeh, M. R., and Mansoury, D., 2012, High-order compact scheme for Boussinesq equations: Implementation and numerical boundary condition issue: Int. J. Numer. Meth. Fluids, 69, 590–605. Hartel, C., Meiburg, E., Necker, F., 2000, Analysis and direct numerical simulation of the flow at a gravity-current head. Part 1: flow topology and front speed for slip and no-slip boundaries: J. Fluid Mech., 418, 189–212. Hirsh, R. S., 1975, Higher order accurate difference solutions of fluid mechanics problems by a compact differencing technique: J. Comput. Phys., 19, 90–109. Hoult, D., 1972, Oil spreading in the sea: Annu. Rev. Fluid Mech., 4, 341–368. Huppert, H., and Simpson J. E., 1980, The slumping of gravity currents: J. Fluid Mech., 99, 785–799. Kreiss, H. O., and Oliger, J., 1972, Comparsion of accurate methods for the integration of hyperbolic quations: Tellus, 24, 199–215. Kundu, P. K., 1990, Fluid Mechanics: Academic Press. Lele, S., 1992, Compact finite difference schemes spectral-like resolution: J. Comput. Phys., 103, 16–42. Liu, J. G., Wang, C., and Johnston, H., 2003, A fourth order scheme for incompressible Boussinesq equations: J. Sci. Comp., 18, 253–285. Numerov, B. V., 1924, A method of extrapolation of perturbations: Roy. Astron. Soc. Mon. Notice, 84, 592–601. Ooi, K. S., Constantinescu, G., and Larry, J. W., 2007, 2D large-eddy simulation of lock-exchange gravity current flows at high Grashof numbers: J. Hyd. Eng., 133, 1037–1047. Shin, J. O., and Dalziel, S. B., and Linden, P. F., 2004, Gravity currents produced by lock exchange: J. Fliud Mech., 521, 1–34. Simpson, J. E., 1997, Gravity Currents: in the Environment and the Laboratory: 2nd Edn. Cambridge University press. Simpson, J. E., 1986, Mixing at the front of a gravity current: Acta Mechanica.,63, 245–253. Stommel, H., 1948, The westward intensification of wind drive ocean currents: Trans. Americ. Geophys. Un., 29, 202–1948. Tritton, D. J., 1998, Physical Fluid Dynamics: Oxford university press. Weinan, E. and Liu, J. G., 1996, Essentially compact schemes for unsteady viscous incompressible flows: J. Comput. Phys., 126, 122–138. Wood, I. R., 1970, A lock exchange flow: J. Fluid Mech., 42, 671–787.